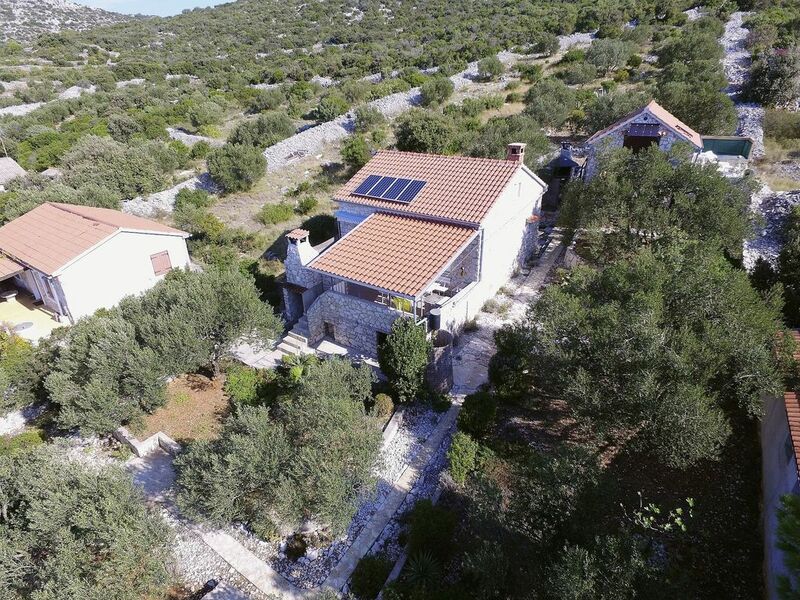 This holiday house is located on the island of Pasman, Dalmatia, Croatia, directly on the beach, and it is available to rent throughout the year. The island has a regular connection with the mainland - it takes about 15min with the ferry to get to the island from Biograd na moru, and the ferry is leaving more then 10 times a day. With its two bedrooms on the base floor, each with queen beds, and another two beds in the room on the attic, it may host up to 6 persons. The kitchen is equipped with cutlery and crockery, a refrigerator with freezer compartment, a fireplace and a cooking stove. An outdoors shower and a build barbecue are available outside the house. The house is accessible by car to about 250m distance, by the road that leads to the bay of Vitane, on a makeshift road over the hill, that can be affected by weather conditions. For this reason, these roads are not recommended for lowered cars, but that does not mean that you necessarily have to have an SUV or a four-wheeler. These roads are passable for a normal car, with slow and careful driving. Ferry tickets are not included in the price. The parking in the bay Vitane is without further costs. The advantage of having your car close to the house is that you may easily go on trips and explore not only the immediate, but also the wider area. The other possibility is to leave your car (one per group) on a free and secure parking in Sveti Filip i Jakov, which is on the mainland. Transfer from this parking place to the house once upon arrival and back to the car once at the end of your stay is also free of charge. In the booking process please inform us if you choose an access by your own car or the service of transfer. This is a pet-friendly accommodation - pets are on request and against surcharge welcome (5,00 EUR per day per pet). Minimum stay is 7 days, from Saturday to Saturday only. Electricity is generated by solar power, 220 V, but no household appliancies may be used except of battery rechargers and lights. Running cold water is installed in the kitchen and bathroom. An outside shower has a black "boiler", a container which is heated by the sun. Water and electricity should be used sparingly here. This water is originally tap water, but as it is staying in the tank in hot weather, we recommend it to be boiled before drinking, or that the users of accommodation would purchase bottled water for drinking. Bed linen are prepared for you. Fresh bed linen arrives once a week. Bathroom towels and beach towels are not available, please bring your own. There is the possibility to rent a motorboat (on request, and provided that the client owns an acknowledged boat driver´s license). Bring along your cell phone, so you can contact us in case of need. Mobile phones can be recharged in the house with their regular home charger, so make sure to bring it too. Kindly check in during the morning till early afternoon at our agency, because the transfer and the arrival to the reserved accommodation unit is very inconvenient at night. After the check-in in our agency you will travel to the island. If you find these details unclear or you have any further questions for which answers can not be found here, please contact us. The Agency can not be held responsible if the customer does not inquire for the details that are important to him but are not mentioned, or for details of the object which are out of any reason not completely clear to the customer. Tkon (otok Pašman) is the right destination for your vacation? Zelanto Veli is the name of this object, located in Tkon (otok Pašman). This object is 10 m of air distance away from the sea. During the summer days, look for refreshments for yourself and your family on the beach that is 10 m away from the object. The beach is: pebble beach. To stay on the beach, make sure that you bring towels and protect yourself from the sun with a hat or sunshade, and use a protective cream. Zelanto Veli has a secured parking, which is another advantage of this accommodation, and is of crucial importance if you travel by car on your vacation. During your vacation, most people love to prepare fish or meat on the grill for dinner or lunch. And after dinner enjoy the night in a pleasant company. The object "Zelanto Veli" has Grill, so if you like barbecues then you will definitely enjoy staying in this object. If you are traveling with a pet then you will be positively surprised because this facility has the option of accepting pets. Pet friendly accommodation - only by prior arrangement with the agency (extra fee paid to host). Any additional questions related to the beach or destination Tkon (otok Pašman) please check with your host because they still know best the location. We wish you a warm welcome to our facility Zelanto Veli in destination Tkon (otok Pašman). Accommodation Zelanto Veli is located 10 m from the sea, 5000 m from the center in the town Tkon (otok Pašman). This accommodation offers a view of the Sea and green area. Type of beach pebble beach. Private accommodation Zelanto Veli is ideal for 6 persons and has 3 rooms in the accommodation. Pet friendly accommodation - only by prior arrangement with the agency (extra fee paid to host).